Is the Chinese oil consumption growing faster than the US oil production? Chinese oil consumption and US oil production are growing fast. 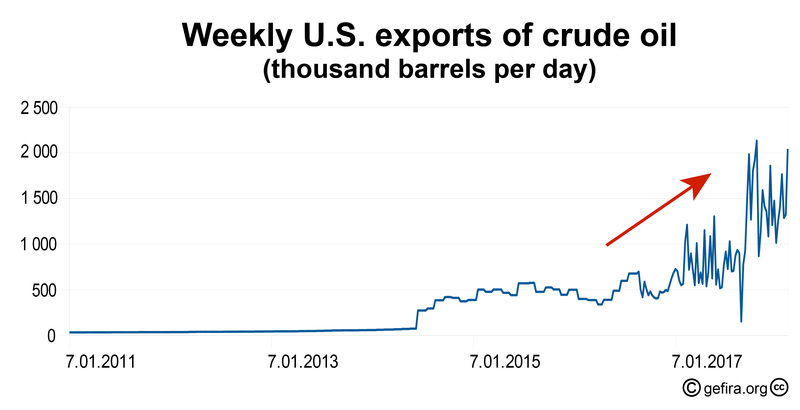 Analysts have a special interest in the US oil production data. The financial media comment every week on the latest data about oil production and consumption from the US Energy Information Office (EIA). There is also a lot of interest in the weekly reports on the number of oil rigs form the analyst firm Baker Hughes. But what about Chinese oil consumption? For oil consumption analyst rely on limited official Chinese data. Oil consumption in China is a big unknown and can be much higher than is estimated by the Organization of Petroleum Exporting Countries (OPEC) or the EIA. And what do we know about the Chinese strategic reserves? If production increase does not meet Chinese demand, we expect oil price pass the hundred dollars within two years. The year 2017 highlighted some changes on the global oil market. Firstly, despite the increase in production of this raw material in the United States, its stored reserves are decreasing rapidly on an annual basis. Secondly, a sharp increase in oil imports from the United States to China has contributed to the fact that Beijing has become the world's largest importer of oil. Thirdly, the forecasts indicate that before 2025 the Middle Kingdom will overtake the US a largest consumer and will be responsible for 18-20% of the world's oil consumption. 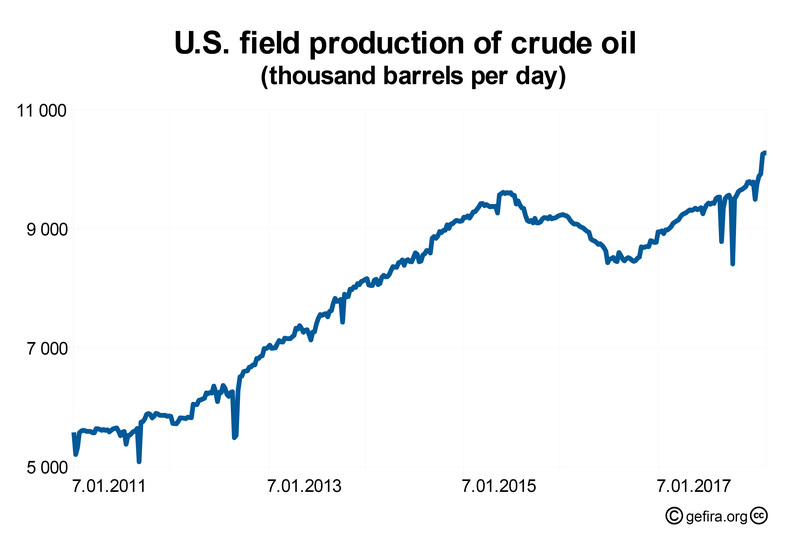 The level of oil production in the United States is growing steadily. In mid-February 2018, its production in the US was over 10.27 million barrels per day, an increase of 20% compared to February 2016. Washington became the largest oil producer, ahead of Saudi Arabia and Russia.1) Increased oil production, contrary to what might seem, is not reflected in the increase in its oil stocks. 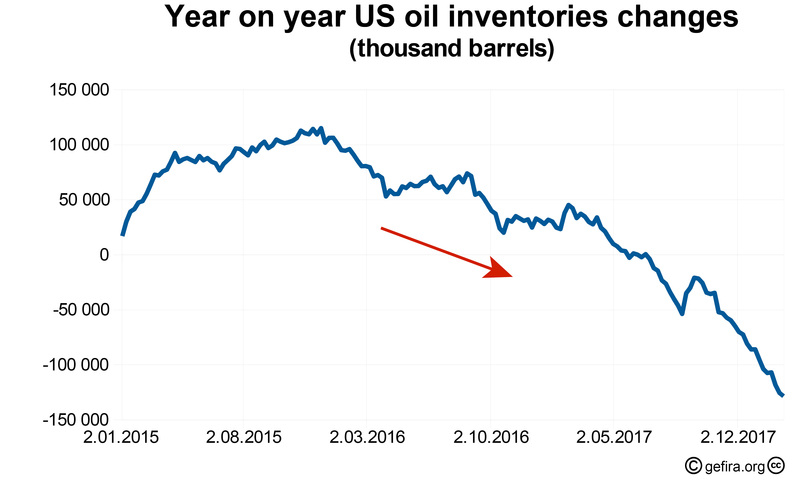 If we compare the difference in the level of crude oil reserves in a given week with the same period last year, then the decrease in inventories, which takes place from November 2015 (excluding seasonal perturbations), is noticeable. At this point the question arises: if oil production increases with a simultaneous decrease in its reserves, what happens to extra produced oil? Export analysis gives the answer. In mid-February 2018, its level increased by almost 68% compared to the same period last year, and by about 500% compared to February 2016. 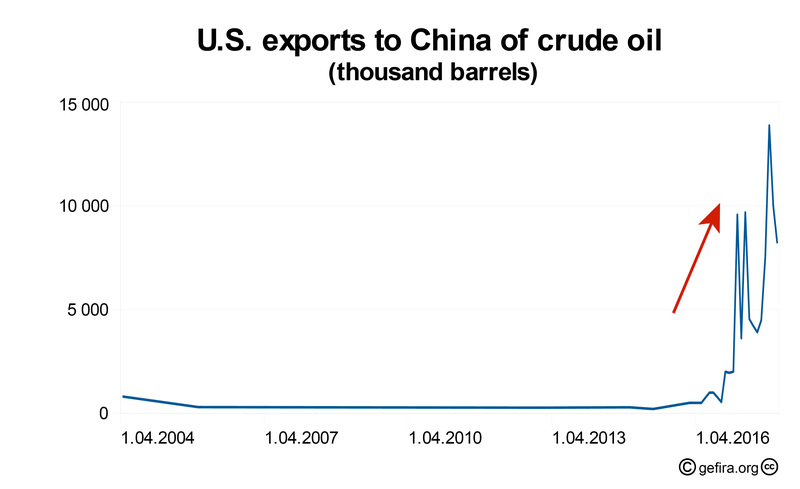 It is interesting that at the same time, with the increase in oil sales, its exports to China increased. Its relation indicates a four times greater share between December 2016 and the same month in 2017. 2) Thus, China in 2017 became the world's largest importer of crude oil, and the level of import of this raw material was 67.4%. total Chinese demand for this product. 3) China National Petroleum Corporation (CNPC) predicts Chinese demand for oil will grow by 4.6% in 2018 and reach 12 million barrels per day (CNPC, OPEC, EIA, and IEA data are different).4) The Energy Information Agencies (EIA) predict that world oil consumption will increase to 104 million barrels a day in 2030.5) International Energy Agency (IEA) predicts that demand for oil will increase by 12 million b / d to 2025. 6) On the other hand, the Organization of the Petroleum Exporting Countrie (OPEC) indicates that the current consumption is 98 million b/d.7) If we combine the data from the different agencies, we can anticipate that oil demand will reach between 108 and 109 million barrels per day in 2025. If we look at population growth, the total number of cars and the estimation of oil consumption by the transport sector we expect the growth of oil consumption to be much higher than generally is forecasted by the formentioned organisations. Our results of oil consumption in China indicate that in the next decade its consumption will increase and in 2025 it will reach the level between 19.6 and 24 million barrels of oil per day. Thus, in a few years the level of oil consumption in the Middle Kingdom will be larger than in the United tates. This means that China will be responsible for even 18-20% of the world's oil demand. If daily consumption goes up and China want to maintain enough reserve to proceed 90 days (which will have in 2020) has to increase its Strategic Petroleum Reserve (SPR) to replace their import in case of a conflict with the US. 8).If the Chinese leaders want to keep the 90-day SPR in 2025, their reserves (while maintaining the current level of production) will amount to 1,400-1800 million barrels of oil. This is more than double the current 90-day US reserve level. The change in Chinese oil demand is as important as the change in oil production. A larger than expect oil consumption in China can come as a big surprise. 1. How soaring U.S. oil exports to China are transforming the global oil game, Reuters 2018-02-09. 2. Petroleum & Other Liquids, U.S. Energy Information Administration. 3. Crude Oil Imports by Country, World's Top Export 2018-01-29. 4. CNPC forecasts Chinese 2018 oil demand to grow 5% to 12 million b/d, S&P Global 2018-01-16. 5. Annual Energy Outlook 2017, EIA. 6. World Energy Outlook 2017, IEA. 7. Monthly Oil Market Report, OPEC 2018-02. 8. China goes underground to expand its strategic oil reserves, Reuters 2016-01-06.